I was at the gym reading Garden & Gun magazine – because how could I not with a name like that?! – when I started reading the cover article about Southern BBQ. There are debates, cook-offs, traditions and opinions depending on which state you’re in: cole slaw on the sandwich or on the side? Vinegar vs. ketch-up base? Does the bun even matter? 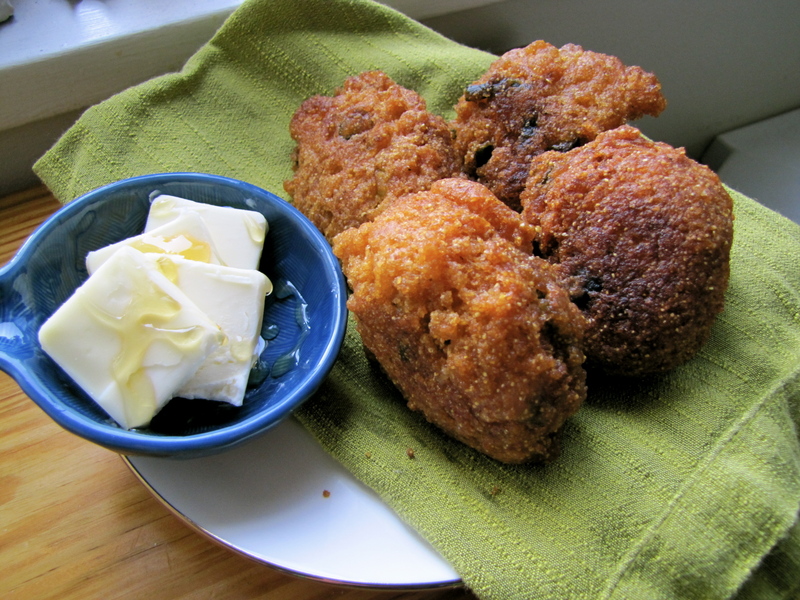 Along with a list of the best BBQ places in cities all over the south, the magainze also offered this amazingly easy and delicious hush puppy recipe! Because really folks, what’s BBQ without a side of hush puppies? Crispy, crunchy outside, soft, warm savory inside. Dip it in ketch-up or honey butter (shown here) and you’ll never want to stop chowing down. Ring in summer with these puppies (heyo!) and some BBQ chicken, corn, slaw, beans and the works! 1. In one bowl mix everything from cornmeal to cayenne pepper. 2. In another bowl mix eggs, buttermilk and scallions. Whisk mixes together until just combined.Let rest for 10 minutes. 3. In a 6-quart stockpot or a mini electric fry pot, heat oil to between 350ºF and 360ºF, keeping the oil at a steady temperature. Once the oil is hot enough, drop small scoops or rounded tablespoons of the batter into the oil in batches of eight. 4. The cooking process is fast, about 60 to 90 seconds. As soon as the hush puppies start to float, use tongs to rotate (both sides should be crisp and light golden brown). It helps to put a pasta strainer on top of them at this point to keep them submerged. 5. Set aside onto baking sheet and place in oven to keep warm. Serve hot!